The world is experiencing the power of ‘Think Blue.,’ Volkswagen’s international environment-oriented campaign, which was launched in Europe in 2010 and over the last months has been rolling out in the USA, Canada and Australia as well. With a huge focus on ecology, the brand just can’t miss big days for those who care about the nature—ahead of Earth Day (April 22), in Canada the brand released a simple but smart advert encouraging to check the tires’ air pressure regularly, and on the occasion of World Environment Day (June 5), Volkswagen and DDB Sydney developed an integrated campaign with the ‘Why be environ-mental when you can be enviro-normal?’ tagline for Australia. 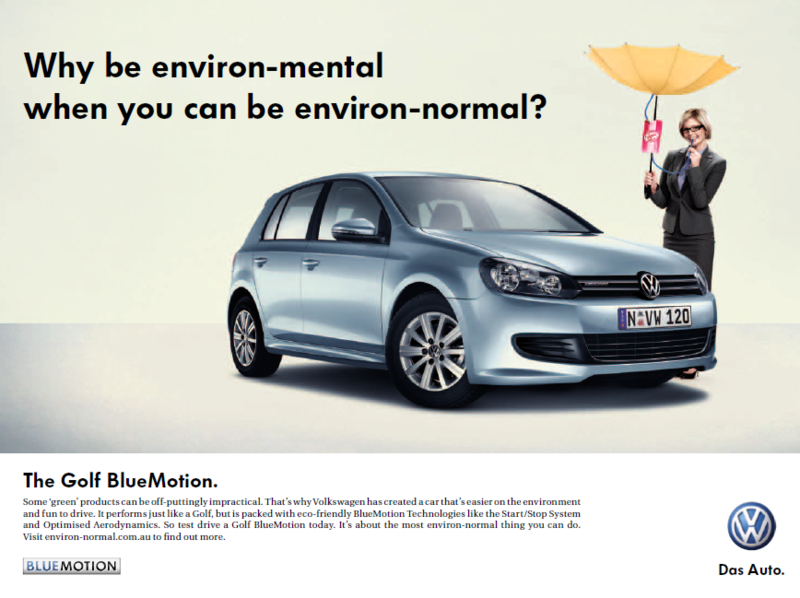 The auto brand, which is famous for its eco-friendly cars with the highly acclaimed fuel saving and low emission BlueMotion technologies, has featured the Golf BlueMotion model in the promotion that will be running in press and on web for four weeks and out-of-home for two weeks. “Some ‘green’ products can be off-puttingly impractical. That’s why Volkswagen has created a car that’s easier on the environment and fun to drive, although it looks a like a normal Golf, it’s packed with the BlueMotion Technology that focus on achieving efficiency and sustainability. Great news for those wanting to make less of an impact on the environment, but at the same time, less of a fuss,” states the brand in its ‘manifesto’ at the dedicated online destination, where one can learn more about the vehicle and discover new imaginary products, which can help people be more eco-conscious (but are weird to use). The list of environ-‘mental’ unconventional solutions can be found at the website “made from 100 % recycled websites” and includes the Shopping Shirt (a hands-free tee with a belly pocket for groceries), the Yumbrella (collects rainwater to drink instead of bottled water) and the Magnifryer (an improved frying pan with a magnifying glass that can be used for cooking on sunny days). “The notion of this campaign is fun and simple: you don’t have to buy something silly like a Yumbrella or a Magnifryer to help the environment. The Golf BlueMotion looks and drives just like a Golf, but is also one of Australia’s most fuel-efficient cars,” commented Simon Veksner, deputy executive creative director at DDB Sydney. The launch of this tongue-in-cheek campaign follows the release of new similar commercials promoting Nissan‘s Leaf and Renault‘s ZE and revolving around the notion that electricity is better than gas (AdAge reports that the brands didn’t comment on why the adverts resemble each other so much).